The alley-side wall of the Oriental Theatre has probably had everything sprayed on it except aerosol paint. 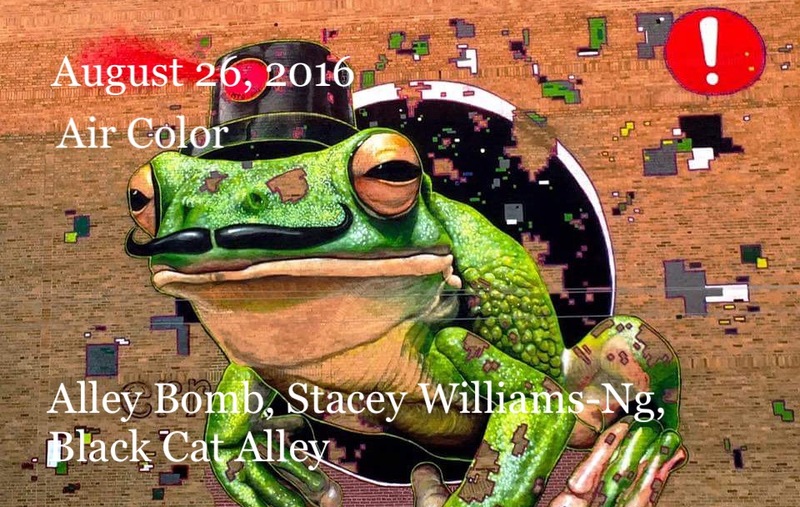 That all will change later this fall when a handful of hand-picked muralists will get a shot at bombing that famed back way as a part of the Black Cat Alley street fest. BCA kicked-off in July, when famed street artist MTO got first dibs lighting up a prime spot on the East. An frog, with a penchant for anachronism, rocking a spray-cap top hat and a mustache climbs out of hole in upper floor of the cleaners Kenilworth and Prospect. BCA teamed up with the Eastside BID to close out summer in Milwaukee out with a week of outdoor art events starting September 10 and climaxing with a street fest the 17th and 18th on Kenilworth. 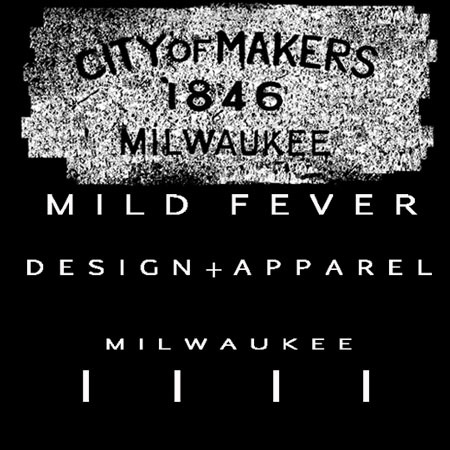 When it’s done artists enlisted by BCA will have coated Milwaukee with more much needed public art. Stacey Williams-Ng didn’t know it when she set out that she wasn’t gonna let MKE be out done by West Allis. Local Trolley: How did you get involved with Black Cat? Stacey Williams-Ng :My friend Tim Decker, who’s an instructor at UWM Kenilworth, struck up a conversation with me one day a couple years ago about using art to revitalize that alley. He was concerned about it being a dangerous area for students to walk through at night. One thing led to another, and the idea for a mural festival was born. We started talking to the community leaders and making the case for street art, and named it “Black Cat Alley” in an homage to the UWM mascot, the panther. LT: Yeah them kids better be careful trying to sneak in the movies. Whatever the reason, anything to get some street art going. Black Cat is it about Street Art, what is it that makes street art such a unique addition to the landscape of urban areas? SWN: Who ever said that the only thing we should see in the urban landscape should be either bare walls, or marketing messages? When you’re in the city, it’s a blessing to have your eyes rest on something that’s not trying to sell you anything: it’s there to make you think, or to smile. LT: Where is Milwaukee on the spectrum of urban areas that embrace street art? SWN: Great question. We have some really iconic cultural murals here, created and kept safe by communities all around Milwaukee. The Reynaldo Hernandez piece on North Avenue, for example, is over 30 years old. And there are many examples similar to that. However, Milwaukee has not yet embraced street art as a movement at the scale that other cities have. Just one trip to Chicago’s Wabash corridor, or to Denver’s River North district, or to Miami or Brooklyn or L.A. or Baltimore would open anyone’s eyes as to the tremendous impact that street art can have on a city. Our team wants to see that happen in Milwaukee. LT: Definitely Reynaldo is a legend. We can thank him for the Mural of Peace on the Esperanza Unida building. Ammar Nsoroma is another unsung artist and muralist in Milwaukee. He did the Middle Passage mural that stood on Wisconsin Black Historical Society for ages. Then you got the new schoolers like Fred Kaems, J Bird and Chacho Lopez. The slate BCA pulled together is solid too. Brandon Minga has been paying dues for a little bit now. Tia Richardson is phenomenal. I bought a sketch book from her at craft fair that she bound. I can’t wait to see what all the artists come with. What are some of the most exciting parts about Black Cat Alley fest? SWN: Am I allowed to say, “everything”? I guess my favorite thing is having out-of-town artists come in and intermingle their ideas with local artists. We are putting them all together in one space to share their own voices and uplift and teach one another. And then we’re inviting everyone else to the party to see what they create. LT: Parting thought shout outs!? SWN: I’d like to shout out to our local Milwaukee artists who will be participating, and whose entries were chosen by our esteemed jury: John Kowalczyk, Jenny Jo Kristan, Brandon Minga, Jeff Redmon, Tia Richardson, Adam Stoner, Ian McGibbon and Renee Martinez. We can’t wait to see what they have in store for our alley! BCA street fest begins September 17, 2016 will also feature visiting artists CERA and Bunnie Reis.